Instagram is a Facebook owned company now after Mark Zuckerberg bought it for around $1 billion. Instagram being an ad free app made us think that why would Facebook invest so much to get it, well the answer is promoting ads, on the app that also happened to be largely populated and used. Instagram is ads free for now but they have signed a deal with an advertising agency called Omnicom which will be spending $100 million over a year on Instagram for ads. Instagram have over 150 million users right now out of which 60% users are from outside US and 55 million photos are uploaded daily on Instagram which makes it an even better mean to advertise through. 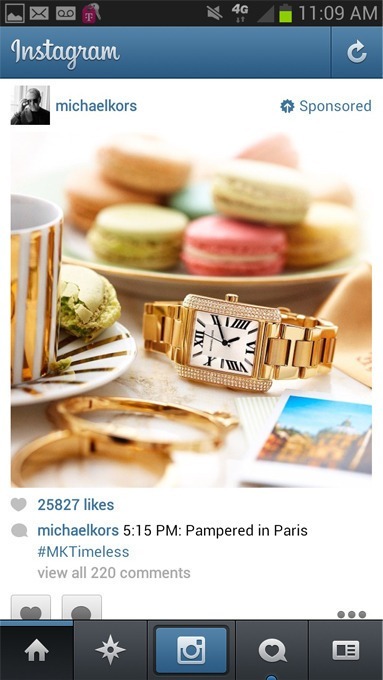 The way the deal between Instagram and Omnicom will work is that people will start seeing ads in their regular feed. The ads will consist of both Pictures and Videos. There will also be a few famous selective brands that will appear on a user’s feed as Omnicom is not planning to bombard users will a lot of ads. The Images and Videos shown in the advertising will be of high quality and will stay there for more than a day. Instagram has been testing to bring ads on their apps since last year when they started adding brands like Michael Kors, General Electric, Levi’s, Lexus and Ben & Jerry’s who after posting their photos and videos were likes and followed by a lot of Instagram users, but the problem was the age and gender of these followers which was taken from their respected Facebook profiles, because advertising depends on age and gender and everyone have their own preferences. We are not sure whether Instagram users would like to have ads included in their feed as Instagram haven’t implemented anything yet but with time we will see how users will react to it. Facebook just made back 10% of what it invested in Instagram and will soon recover the remaining 900 million in no time. What do you think about this news are you in favor of it or against it?